Author Chad Zwolinski using Nearpod in his classroom. I had always told my students that PowerPoint was my pet peeve. Every teacher has the same recurring dream (or should I say, nightmare): You assign a group project that includes multiple research days so you can catch up on grading, planning and breathing. The next four days of class, however, you have subjected yourself to presentation after repetitive presentation of students reading word for word off of their PowerPoint slide deck. Nothing added, nothing analyzed, just a string of words in paragraph form plopped onto a slide in hopes there is enough information added from Wikipedia to get the points without arousing suspicion of plagiarism. In an attempt to avoid this fate, I would model how PowerPoint was meant to be used by giving PowerPoint lectures with only one or two words on the screen. I held myself up as the perfect example. No fill-in-the-blank notes, just a screen with two words and a picture. This was truly the definition of teaching at its best; this was the way technology was meant to be used in the classroom setting! Nevermind that my students were still mostly passive in their learning… I convinced myself that because they needed to be actively listening to understand my lecture they were learning. I convinced myself that because they weren’t spending time mindlessly copying the words off the screen they were instead listening to me, processing my words, and connecting them to the picture or term on the screen. To be blunt, I was ignorant in my understanding of how my teaching was affecting all learners. Instead of using the amazing resource I had in front of me, the students, I continued to make the lesson about me. I let my own personal bias and experiences in my education career steamroll what was best for my students. Though I didn’t often lecture using PowerPoint, today I use that strategy even less. Like every teacher, I try to come up with creative lessons, activities and group work that engages my students while helping them foster an innovator’s mindset of inquiry-based learning. However, as a History teacher (I teach AP US History to sophomores five hours a day) I still found it necessary to deliver information to students directly. While reading is fundamental to the work we do in our class, I also am very aware that many students do not complete, comprehend or enjoy that aspect of the class. I also enjoy delivering content to students as I attempt to weave a narrative that both entertains and explains. The problem with PowerPoint is that as much as I attempt to focus my students on the “story” part of history, they are determined to write down any and every word they can in preparation for the assessment. It was at a professional development session this past summer (I can’t believe I am writing something about PD either) that I was introduced to Nearpod. This interactive way to develop questions, activities and collaboration within existing PowerPoints revolutionized my teaching. Not only did it give me an option for when I was absent—this application is the closest I’ve come to actually being in the classroom when I’m away—but it also allowed me to flip my classroom and better engage students. Seeing how I could actually make my lectures interactive was the fulfillment of what I had been trying to do for years! 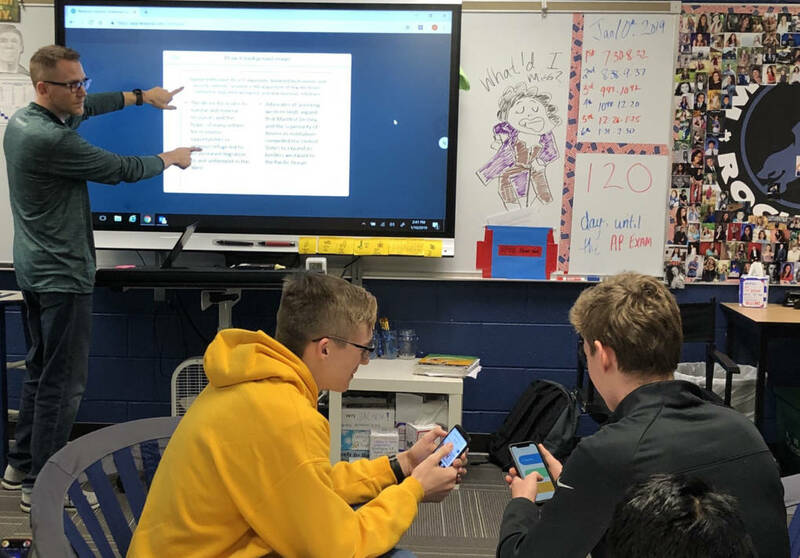 Instead of just preaching my vision of what PowerPoint could be—a tool to help deliver content knowledge to students who were actively engaged in learning, not just rote reading, copying or note-taking—I was now seeing it in action. Using the tools within the app I could create guiding questions that allowed students to collaborate on the slide while I was using it. Students were actively answering questions while I was lecturing, giving me real time feedback of their understanding of the topic as well as their understanding of what was important. Even if they were shy or struggled to grasp the material the night before, I had full participation in the lesson. Even unmotivated students saw the opportunity to get immediate feedback and guide the lesson themselves. Instead of the normal hand or two that directed our discussions, I saw all 30 students’ voices on the screen and could comprehend what part of my narrative was being lost. Using Nearpod, I have the ability to embed assessments into the slides and my personal favorite, drawing activities. Right on their phones students could dissect a primary source document and share it with the class. My nightmare had become a dream: the entire class was fully engaged in a PowerPoint lesson! 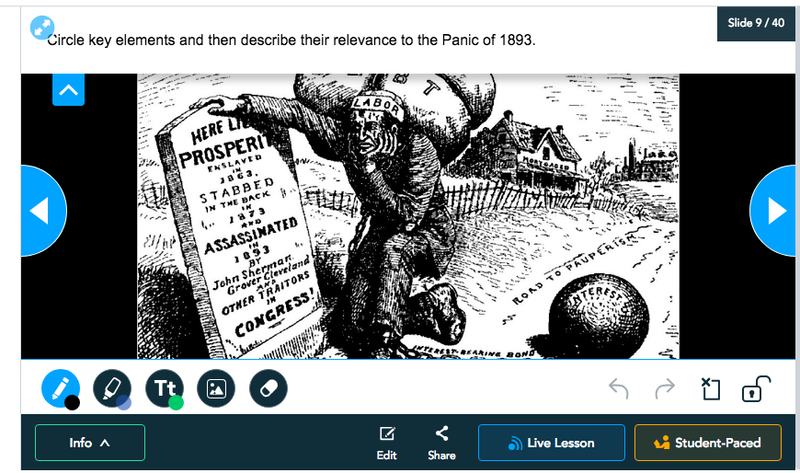 My students also have the ability to move away from those boring, repetitive presentations and use Nearpod as a way to engage their audience. Not only has my teaching changed, but so, too, has my students’ understanding of what a presentation can be. I actually look forward to assigning group projects now and not because of the catch-up time. Seeing how students have taken my example and molded it into an interactive presentation shows me so much more about their research. The questions and activities they place into their presentation represents the depth of the knowledge they obtained. Now my students are the ones setting the example. Chad Zwolinski is from Michigan. He is going on his 10th year of teaching AP US History at Rochester High School with a Masters in Education. He has five sections of sophomores, is in the process of writing his second APUSH book, sponsors the Junior Class and Social Studies Honor Society and serves as Summer School Principal. Chad has a wonderful wife and two children, and is a Marvel fanatic.